We love fall. We love autumnal equinoxes, we love the crisp mornings and cool breezes, we love that kids have to go back to school and we love pumpkin-spice everythings. And no, we aren’t sorry about the last two. It’s called embracing the season, okay? We are a propane company that serves Upstate New York with fixed rates on your monthly billing, meaning you can get stable pricing all year long. 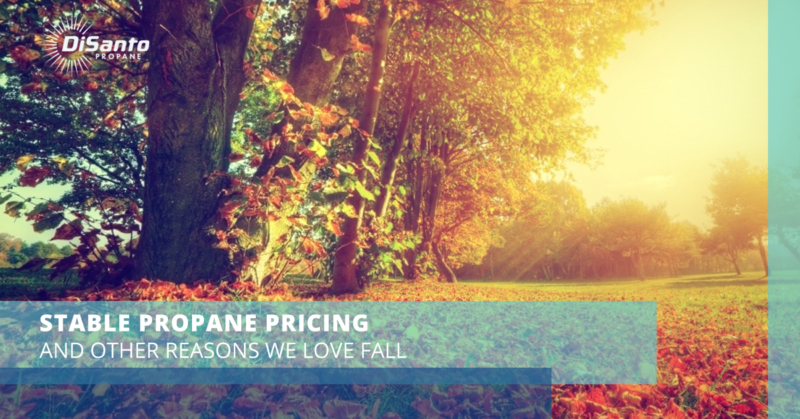 And while many folks who use propane gas services for home (and/or their business) might not think about the typical spike in their monthly bill that occurs once the temperatures drop and the season changes until they see the unsightly bill for themselves, it’s easy to understand what stable monthly pricing can do for those who are on a budget. Instead of paying very little and growing used to it during the summer months only to have a sizable bill that you didn’t anticipate needing to pay, stable monthly billing brings you the peace of mind that our customers love. This is yet another reason we love fall, because many of our new customers come to us because they’ve experienced what it’s like to not have this fixed monthly pricing option. Growing our business by helping our customers in a practical way is one of our favorite things no matter the time of year! It’s just one more reason we are one of the top propane suppliers in the entire state of New York, if not beyond! After All, we’ve been around for over a quarter of a century providing propane services — we feel we must be doing something(s) right if we’ve made it this far as a family-owned propane company! Before we get into the other reasons we love fall, for there are many, allow us a brief aside about our commitment to customer service. Seeing as how we were discussing what has made us successful for over 75 years here at DiSanto, we might as well address another reason or two that we’ve been able to thrive for multiple generations! It’s pretty cool, when you think about it. We are fully aware that if you were to ask pretty much any company that is customer-facing out there about their customer service quality, they’d respond with an optimistic report of their habits and policies. We’d like to point out, however, that most companies haven’t been around for over 80 years. Likewise, many companies don’t offer 24/7 account management from your smartphone or computer, paperless billing, and the aforementioned stable propane pricing. Likewise, you won’t find too many propane suppliers out there that offer as many wide ranging options that are intended to accommodate all of your propane needs like you’ll find at DiSanto. From small tanks to large, we can handle them all. Need an underground propane tank installed? We’ve got you covered. Need fleet fueling services that help extend the life of your fleet’s engines? Check. Are you a farmer who wants to use one of the cleanest and most efficient energy sources available? You get the idea. Whether you seek propane services for your home or business, you can count on our team to be professional and courteous. If your propane happens to be running low, we will make it a priority to solve your issue in a timely manner. We are just a phone call away! And as Linda so graciously described above, we make a point to treat each of our customers with dignity and respect. You could say that “consideration” is our middle name! Of course, you’d be wrong, because that doesn’t make any sense, but you could still say it, if you want to. We already discussed how helping people get fixed monthly pricing on their propane bill is one of our favorite parts of it getting a bit chillier, but our autumnal affection goes well beyond stable propane rates. For the rest of today’s post, we’d like to offer up a few more reasons why we have an affinity for fall. Campfires – You might be lucky enough to have a firepit in the back of your house. Unfortunately the summer is usually so hot that even the thought of building a fire and sitting around it will make you sweat uncontrollably. Once the temperature begins to drop, however, the idea can sound much more pleasant. Although it’s not nearly as pleasant as the actual experience, complete with the sizzles and cracks of the wood along with s’mores, a few beverages, and good old fashioned quality time. What’s not to love about a cozy campfire? Leaves Change – Before the winter winds blow them away never to be seen again, we get a few months, if we are lucky, of some of the most glorious fall colors in the world up here in this part of the country. The blend of reds, goldens, yellows, and oranges is simply unmatched — don’t try to convince us otherwise, either. Pumpkin Everything – Call us basic, call us whatever you want, really. We love pumpkin patches, pumpkin pie, pumpkin spiced lattes, and even pumpkin straight out of a can! Okay, maybe not the last one, but if you add sugar to anything pumpkin, the odds are in your favor that it’s going to be a tasty treat. Fall Fashion – The cooler temperatures and pretty fall colors mean that the fashion trends must follow suit. Luckily, we are seeing less of the “Han Solo” look these days among women (long brown leather boots and a dark vest), as both men and women seem to be stepping up their game in terms of autumnal fashion. We hope this year continues with the upward trend! Staying Inside And Watching Football – Let’s get real for a minute. As much as we write about the beautiful fall colors and getting out to experience them, for many people, fall means football. And football doesn’t only mean football; football means football food, beer, social events, laughter, passion, tears, disappointment, and joy. It also means suffering way too many commercials to enjoy a single game, but that’s a tangent we’d better not entertain! Baseball Playoffs – It’s America’s pastime, so excuse us if we mention how much we love Major League Baseball playoffs multiple posts in a row. But even if you aren’t a Red Socks or a Yankees die-hard fan, there is still plenty to enjoy about the pennant race and resulting playoffs. The best in the world only have a few games to prove their dominance, after having 162 or so in the regular season. The cream rises to the top, as they say! And go Rockies. No More Sweating – We’ll end this post with perhaps the most practical and honest listing — for some of us, fall means we don’t have to worry about breaking a sweat every time we set foot outdoors. Hey, we are just being real. Whether you agree with us regarding the list provided above or not, we are confident that we can reach an accord about how wonderful stable monthly pricing on your propane bill is. Not only that, but switching to DiSanto propane for your commercial or residential propane services can save you money while ensuring you reduce your carbon footprint. Propane is clean, efficient, affordable, and environmentally-friendly when compared with other fuel sources. And we’ve got it here at DiSanto Propane of Upstate New York. Become a DiSanto customer today!